"... He said no one would cry, or grieve, it was truly a celebration of the boy's life. Billy said that, if he went too early, that is how he would want it to be..."
We will be celebrating Billy's (4/20) birthday in our barn on Saturday, April 22, 2017. Bring your sense of mischief!! And forward this to anyone we may have missed. 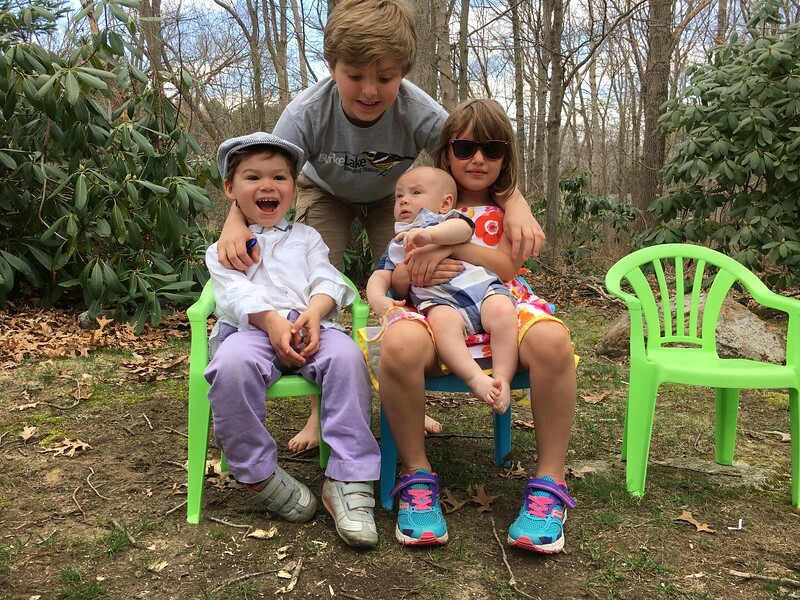 With love from the Palinski Family, here represented by the youngest batch: Sam (9), Anna (6), Liam (2.92), and Oliver Marco "Ollie" (5 months)! Will be joining us this year!! Born 11/29/2016, he's quick with a smile and loves a friendly nose to chew on. Belongs to Kathleen and Ned, or a handsome postman, to be confirmed. Scenes from Billy's party, on April 30, 2016. We will be celebrating Billy's (4/20) birthday in our barn on Saturday, April 30, 2016. Once again, we're hoping for a perfect Spring Day, with outdoor activities. We'll be ready by 4 and DJ's world famous BBQ arrives at 6. Your RSVP will help us with ordering. Please forward this to anyone we may have missed. If you're not here with us, remember to have a smile or pull a prank in his name and raise a glass to our Billy, wherever you are! Meet Liam James Palinski-Brown, Billy's latest nephew! Liam was born in Boston on May 20th, 2014. Plenty more photos at badgerbrownski.smugmug.com (email Kat for password)! 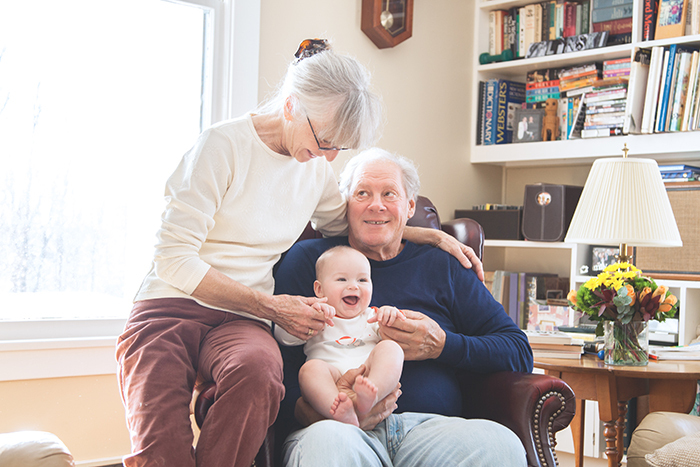 Lovely photos by Bridget McDonald Photography. On the left, words chosen by friends and family to describe Billy. 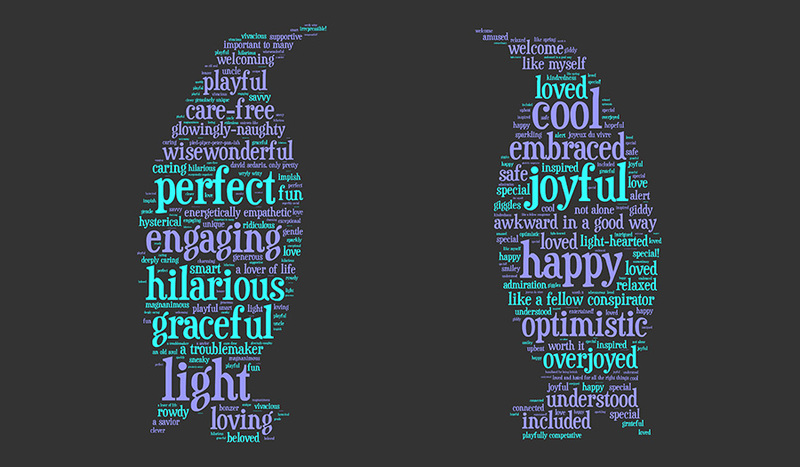 On the right, words chosen to describe the way Billy makes them feel. Can't read the little ones? Here's a full-size version. Originally screened at Billy's 29th birthday celebration in Cambridge on April 20th, 2013. 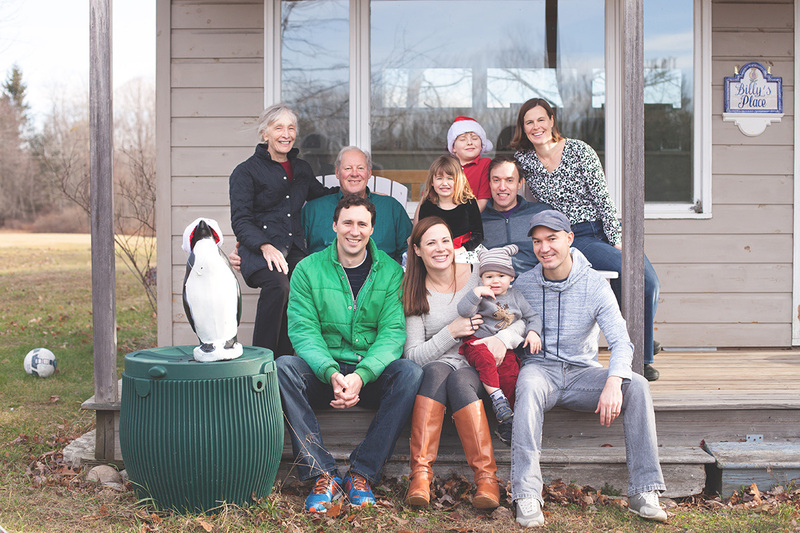 As Billy's incredible loving community spreads out (but continues to do amazing things! ), I thought this would be a righteous way to allow us all to come together whether or not everyone could make it to our annual celebration of him in person. I hope you'll enjoy! Password is Bill's famous penguin's name. If you can't remember it, email Kathleen! New slideshow with pics from Billy's time in Ireland. Thank you for celebrating Billy's 27th with us! Whether in person or in spirit, thank you for being with us this past weekend, and this week coming. Check out this picture slideshow from the party. Hope you can join us to celebrate Billy's (April 20th) birthday a few days early - Saturday, April 17th. We'll be happy to see any of you who can, but we understand that you're all over the world, doing great things. (Be sure to have a crazy adventure for him!) If you're not here for the party, stop by another time. PARTY: Come at 4 PM or so. Dinner will be around 6 and we'll be hanging out into the evening. Party will be in the barn....with upstairs loft for anyone who'd like to stay. The cabin is also available, of course. Please try to let us know you're coming, so we can have plenty of good food! Also, please forward this to anyone we may have missed. If you're not here with us, raise a glass to our Billy, wherever you are! Click here to check out a little project we worked on to celebrate Billy's 25th. You're Invited to Celebrate Billy's 25th! Another April approaches..... our 5th birthday celebration for Billy. We're planning the party for Saturday, April 18th, just a few days before his birthday. This would be his 25th! It's been an exciting year for us: John spent it with the Obama campaign - what a great outcome.... YES WE DID.....Billy would have been all over that campaign! More wonderful outcomes: Kathleen and Ned were married here at Billy's Cabin on June 28th. It was a great and beautiful day (despite the rain). 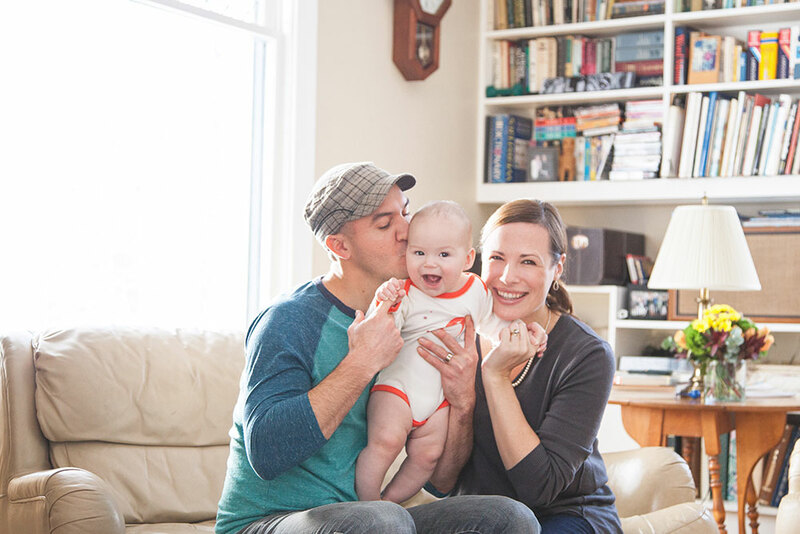 Just a month later, Suze and Tom became parents! Billy's nephew, Samuel William Renaud, was born 7/27/08. Sammy will be here to greet you all and entertain and amaze us. 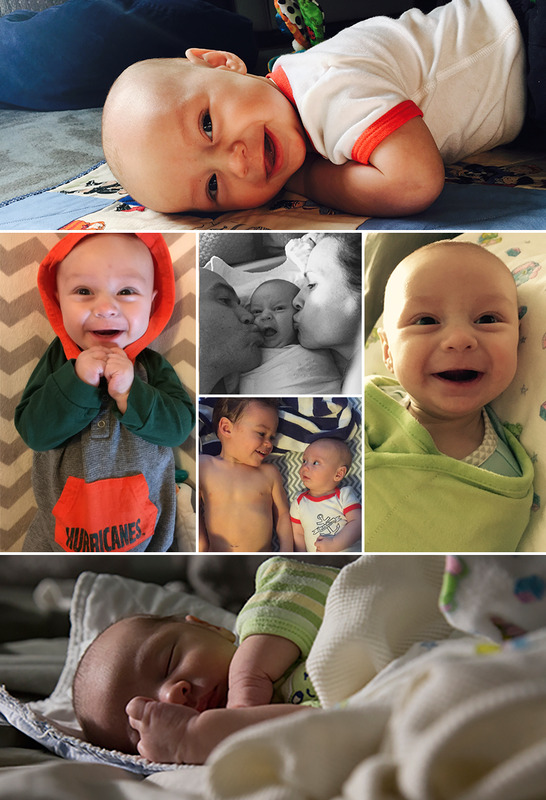 Take a look at these photos of his first eight months! Please try to let us know if you're coming, so we can plan food.....also, help by forwarding this to anyone we may have missed. Many of you have new email addresses, so please send me your updates. Bring sleeping bags, if you're staying. If you're not here with us, raise a glass to our Billy on 4/20/09....wherever you are! Lots of love to all of you from all the Palinski crew. On the weekend of April 18th-20th, 2008, friends and family gathered to celebrate Billy's 24th birthday. Click here to view an audio slideshow of the event. If you have photographs or stories from this or any of Billy's previous birthdays you'd like to contribute, don't hesitate! Contact info is at the bottom of this page. You're Invited to Celebrate Billy's 24th! Another April approaches.....hard to believe that this is the 4th birthday we'll celebrate this way. We are planning Billy's Birthday Party for Saturday, April 19th, actually the day before his birthday. All you wonderful friends are invited, and we will be so happy to see any/all who can make it. No pressure - we will always celebrate his birthday, and if you can't make it this year, we'll see you next time. will be up. Like last year, we'll have the party in the barn.... with a large loft/upstairs for sleeping. For our family, it's an opportunity to catch up with some of the great people from Billy's life, and we want it to be a happy reunion for you, as well. Please try to let us know if you're coming, so we can plan food.....also, please help by forwarding this to anyone we may have missed.....and also, send addresses to me so I can correct the list. On the weekend of April 20th-22nd, 2007, friends and family gathered to celebrate Billy's 23rd birthday. Armed with a dodgy old handicam, we set out to capture some of the action. Here are the results. Since April 24th, 2004, along with the pain and devastation of Billy's death has come something else. It's been the most amazing shower of love and blessings on our family from so many people who knew and loved Billy. Letters, music, stories, gifts and new friends continue to arrive here. Some of you we already knew, and some we only knew about. It has been a privilege for us to build relationships with many of you, as we learned more about our boy. Our hope is that this website may continue the process. Billy connected people....and we'd like to continue to do that through his website. Thank you all for joining us, in person or in spirit, to celebrate Billy's birthday in April. The joining of friends from near and far to celebrate our love for Billy helps so much to bring him forward with us. We are in the process of updating the website with new photos from the party and recent submissions, please continue to send along stories, photos, announcements, etc. Hopefully they'll be up very soon! Do you have a story you'd like to share? Send your comments, ideas, photos, memories to kathleen.palinski at gmail.com.